Ram is one big name in the pickup truck segment as the brand is entirely focused towards presenting this type of vehicles with versatile capabilities and top-notch styling. 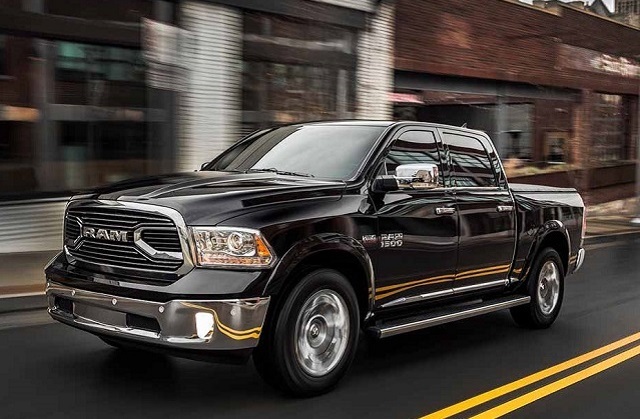 This legacy starts with the Ram 1500 line-up of mid-duty pickups. Now, the makers are up for refreshing this line-up for a new generation as 2018 Ram 1500. What’s in stock this time is improvements in fuel savings and modern design cues (both in exterior and interior). As usual, there will be 13 different trims for the new-gen Ram 1500. These trims include – Tradesman, Sport, SLT, Rebel, Night, Longhorn, Lone Star, Lone Star Silver, Limited, Laramie, HFE, Express and Big Horn. 2018 Ram 1500 will arrive with the familiar engine options. The base model will have 3.6 Liter V6 engine. According to Ram officials, this engine will be tuned. Matched to 8-speed automatic transmission it will be capable of delivering 310 horsepower and 272 lb-ft torque. The engine’s EPA ratings will increase to 19 mpg city/ 26 mpg highway/ 22 mph combined. Towing capacity will be around 7,700 lbs. A 5.7 Liter Hemi V8 engine will come as optional and offer the choices for both 6-speed and 8-speed automatic transmission. This engine is supposed to integrate a cylinder shut-off system and Variable Valve Timing; all but to produce outputs of more than 395 HP and 410 lb-ft torque. The diesel option will probably be 3.0-liter V6 turbodiesel engine. It is able of producing 240 horsepower and 420 lb-ft of torque. With this powertrain new Ram will be one of the most economical trucks with EPA ratings of 30 mpg on the highway and thanks to the high torque it will tow up to 9,000 pounds. Ram 1500 2018 is suspected to come with an array of standard safety features including Electronic Stability Control, ParkSense® Rear Park Assist, Multi-stage Airbags, Tire Pressure Monitoring, Sentry Key® Theft Deterrent System and Speed Control. Considering other pickups like Ford F-150, Chevrolet and GMC Sierra, Ram 1500 is a bit plain-jane on styling. Ram seriously needs to work on exterior styling for 1500 line-up (especially the base model). Fortunately, 2018 Ram 1500 is deviating from the serious ‘work’ look by wearing modern design cues. The base model’s front fascia is coming updated with a reworked chrome grille. Similarly, the front bumper will arrive with some changes as it is suspected to wear a gloss metallic finish. New 17-inch machined steel wheel will all-season tires will come as standard and higher trims will get a 20-inch variant. Exterior color options will include – Flame Red, Blue Streak, Black Forest, True Blue, Luxury Brown, Bright Silver, Maximum Steel and Delmonico Red. 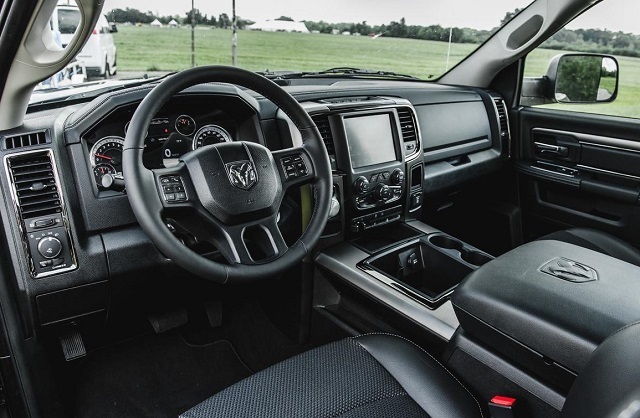 The interior cabin of Ram 1500 2018 will have a host of modern technological features. The Uconnect® 8.4 infotainment system will come standard on higher trims and optional on the base model. The front seats will integrate 40/20/40 split-folding. Ram will make sure to present a competitive price point for this new-gen Ram 1500. Pricing could start from $27,000 and reach up to $54,000. 2018 Ram 1500 will hit the dealerships during the first quarter of 2018.